Martin Gahbauer has joined Elmhurst College as the new executive director of the Russell G. Weigand Center for Professional Excellence. Gahbauer, who officially started at the College on Monday, June 4, previously served for several years as associate director of the Career Development Center at Loyola University Chicago. He also has been an active volunteer and participant at Career Transitions Center of Chicago, a volunteer-driven, non-profit organization that provides job placement services to unemployed and underemployed people. I’m excited about the opportunity to work with a mission-driven institution filled with wonderful faculty and staff dedicated to the success of their students. Before transitioning to higher education, Gahbauer worked in the marketing and advertising industry with clients such as Kellogg’s, Bright Start, Hallmark and Shedd Aquarium. He holds a bachelor’s degree from the University of Illinois at Urbana-Champaign and a master’s degree in higher education from Loyola University Chicago. At Elmhurst, Gahbauer will direct the Weigand Center and its programs, which guide students as they identify, shape and define their career goals; and connects students with professional resources and career development and exploration opportunities. 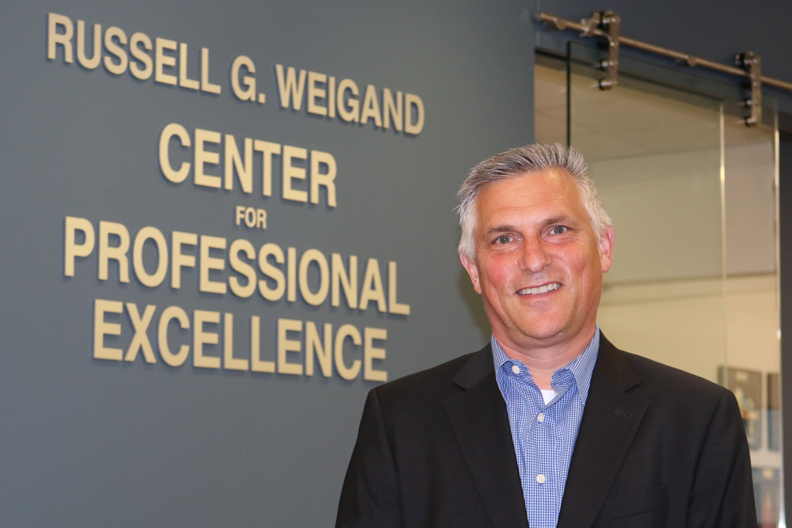 “My goals are to ensure that the Weigand Center for Professional Excellence helps Elmhurst achieve its overarching mission of preparing students to make meaningful and ethical contributions to our diverse and global society,” he said. “I am looking forward to working with Marty as we implement the Elmhurst College 2021 Strategic Plan, knowing the Weigand Center for Professional Excellence will continue to play a critical role in the continued success of Elmhurst College and the students we serve,” said April Edwards, vice president for academic affairs and dean of the faculty.